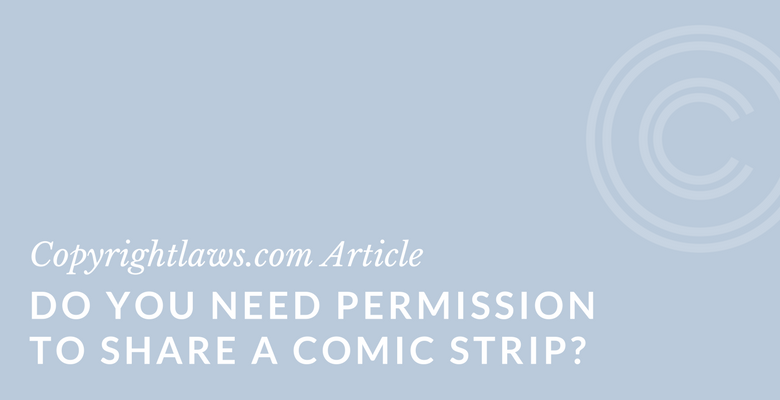 Do You Need Permission to Share a Comic Strip? Sharing or reproducing a comic strip? Do you have permission to do so? Read below for important steps to follow. Is this copyright scenario familiar to you or your business? A funny comic strip is forwarded to you by a colleague. He suggests you copy and paste it to your website because it’s relevant to a recent post or article. Perhaps the comic strip is on copyright law like this one. What do you do? Do you use it? Do you obtain permission to use it? Tip: Always do your research and start with the assumption that all content is protected by copyright. Then determine whether you need permission to use the comic. In this particular situation, the comic is online at www.GoComics.com. It has a menu of sharing options, which allows you to share it to a variety of social media platforms (Facebook, Twitter, Reddit, Google+, Tumblr and Pinterest). There is also an email sharing button and the permalink is provided for sharing. Can I put your comics on my website? Yes you can! Our dedicated sales team can help you put our syndicated content on your website. Can I use this strip for a work presentation or personal use? How about for my corporate intranet or website? Click here to learn more about how to get a permissions agreement to use our content. Can I put your content on my intranet site? Most of the features on GoComics are available. Click here to learn more about how to get a permissions agreement to use our content. Another site, Thecomicstrips.com reproduces the comic and when you place your cursor over it, an icon comes up in red that says: COPYNO.com. This is obviously an indication that permission is needed to reproduce it. This site provides a link to Reprint Cost Guidelines. If for example, you want to publish the comic in a low circulation newsletter the fee is $200 to reproduce it in the print version and $300 in the electronic version of the newsletter. Use of the comic for a presentation starts at $50, depending on audience size, number of repetitions of the presentation, and whether the slides for the presentation will be shared in print or posted online. To post the comic on your non-profit blog for a year, the price ranges from $125 to $400, depending on the estimated audience size. Prices are higher for for-profit internet websites. You cannot modify the image at all. It appears that the fees are guidelines and there is a click-through button which acts as a permission request in which you may insert your own information such as name, email, cartoons to be licensed, purpose of license, and related details to request permission. Information on academic usage for this particular comic/cartoon is provided here. Permission to Share a Comic or Cartoon? So, do you need permission to share or reproduce a comic or cartoon? Yes, comics and cartoons are protected by copyright and in most circumstances you need permission — either implied or explicit — to reproduce them. It is likely that you will come across a website or two that provides you with information about permissions, when permission is required, and the process and fees. Want more helpful information like this? See our online copyright courses. You may also like Copyright Law + Using Images and Photos from Google.